Hello. I wish to offer some helpful tips on how to go about buying a piano in Nigeria. I am the Managing Director of Orpheus Company Limited, the pre-eminent musical instruments and accessories Sales company in Nigeria, with over 28 years of experience. As far as pianos are concerned, we represent Samick, Yamaha as well as Steinway and Sons. The need to write these helpful tips has arisen from the fact that there is a great deal of information a potential piano buyer needs to have before making a decision on a purchase. And since Nigeria is a price-sensitive market, there exists the tendency to be on the lookout for the least expensive product to buy. As it applies to pianos, this is not always the wisest, practical or even financially sound decision, as we will try to elucidate in this article. Firstly, let me start by stating that most potential piano purchasers believe that buying a new piano, regardless of brand or country of manufacture is a good way to go. WRONG! Wrong because there are a lot of “bad new pianos” out there in the market place. So the question then is, ” What is a bad new piano?”. A bad new piano is any cheap or inferior piano manufactured without a care about the quality of parts and materials applied; thus without a quality assurance policy in place, talk less of ISO certifications. Many countries have manufactured low quality pianos over the years. But of recent, most of the cheap and inferior made pianos seem to be originating notably from a dominant country on the Asian continent that seems to espouse an “all-comers” business attitude. Be that as it may, it is impossible to know the difference in the quality of the pianos without technical training. It is therefore important that you enlist the services of an impartial and competent technician who can inspect and certify that the piano you are about to purchase meets international standards (Orpheus Music has technicians on call who can assist you with this service). It is also easy to be deceived by brand names that “sound” German or American. That a piano has an American or German name does guarantee that it was manufactured in those places. Neither does it mean that it was manufactured to acceptable standards. It is therefore advisable that the piano purchaser does his own independent research in order to ascertain the origin of the piano before making an investment. So much for the new pianos. For the used/refurbished pianos, there is a myth existing in the Nigerian market place that needs to be addressed. This myth is that a used piano is very inexpensive, and in some cases is less than half of the cost of a new piano of the same range. This is not true! The certified, quality used pianos are less expensive yes, but not that less expensive that the brand new pianos. Unfortunately, what are regularly advertised as used/refurbished pianos” in Nigeria are mostly low brand Asian pianos that were severely damaged and set aside for destruction as “junk”. The African market, and Nigeria in particular, is slowly becoming a dumping ground for these inferior musical instruments, which are now “repackaged” and sold as used pianos to unsuspecting customers. Most of the pianos are actually purchased from junk dealers overseas by importers out to make a quick buck on any products that may catch the fancy of unsuspecting buyers who end up purchasing pianos that quickly become unplayable after a short period of time. Indeed the need for the inspection services of piano technicians are much more necessary and urgent with respect to used/refurbished pianos. I am sure that after these brief explanations, most customers would like to know how to proceed, so as to ensure that they get good value for money. Strange as it may sound, it is very easy to know when you are buying a good quality piano. The general rule to follow when making a decision about your piano purchase is that the more expensive a new/used piano is, the better it will be. In the piano business, as in many other areas of human endeavor, you really get what you paid for. And so the reality is that when buying a new piano, the higher priced models are better. So if you pay the lowest price you will most likely get the least best instrument. Furthermore, if you get a price for a piano that is ridiculously less expensive than what the market would ordinarily indicate, chances are that you are getting junk, not a piano. I know that this might not sound pleasant to the price-sensitive Nigerian market place, but facts are facts. You can therefore never go wrong if you use the standard just explained as a basis for your decision making. 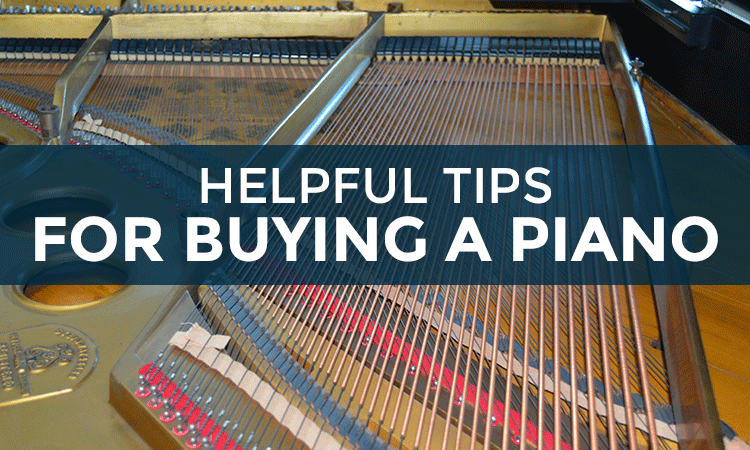 I hope these tips have been helpful, and have provided you with information that will make your piano purchasing decision much easier. At Orpheus Music, we have over 28 years of experience in the piano sales market, which experience we are ready and willing to place at your disposal whenever you decide to make your purchase. Let us hear from you!